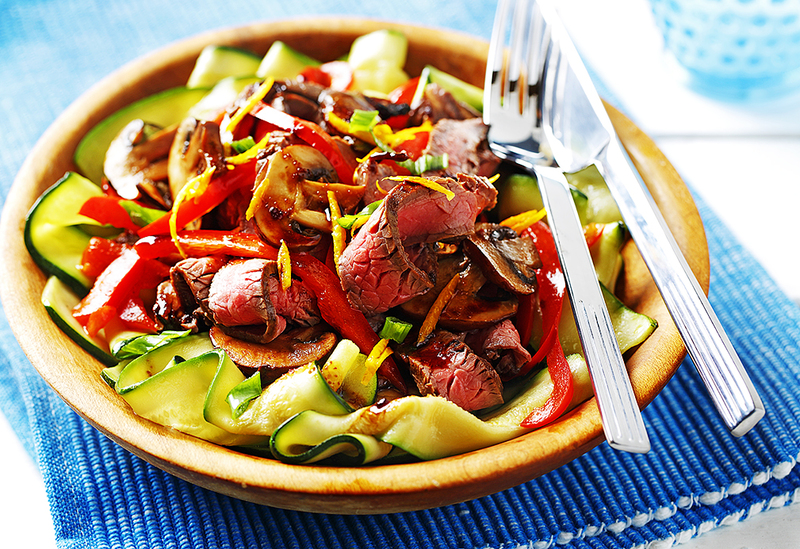 Slow roasted beef that’s been marinated in a sweet and savoury soy-lime sauce makes a worthy topping for a bed of seared zucchini, mushrooms and red pepper. 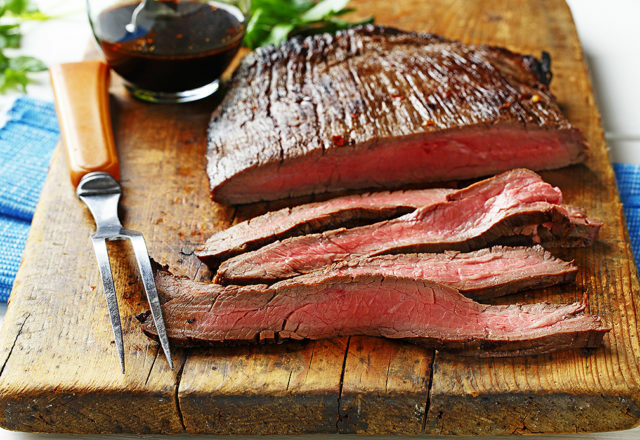 Start by making Flank Steak with Soy-Lime Reduction and then make this recipe the next day. Recipe courtesy of Canolainfo.org. 1. Preheat oven to 185°F (85°C). Thinly slice reserved beef, then cut slices into 1/4-inch(0.5 cm) wide strips; set aside. 3. Working in 2 batches, heat 1 tsp (5 mL) canola oil in a large nonstick skillet over medium-high heat. Add half of the zucchini and cook 1 1/2–2 minutes or until just tender-crisp, using 2 utensils to stir as you would a stir-fry. Place immediately on a serving platter and place in low-heat oven to keep warm; do NOT cover. Repeat with 1 tsp (5 mL) canola oil and remaining zucchini. Add to the zucchini and sprinkle with 1/4 tsp (1 mL) of the salt. 4. Heat remaining 2 tsp (10 mL) canola oil in the skillet; cook the mushrooms and peppers 5 minutes or until vegetables are tender-crisp, stirring occasionally. Add the beef and 1/4 tsp (1 mL) salt. Cook 1–2 minutes or until heated. Spoon mixture over zucchini. 5. Remove skillet from heat, stir in the reserved sauce, orange zest, and orange juice, drizzle over all, and sprinkle with green onion. *Note: Reserved from preparing the Flank with Soy-Lime Reduction recipe.